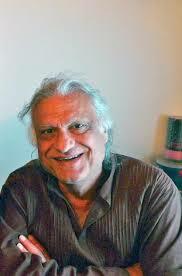 Sarmad Sehbai’s work as a poet, author, playwright and filmmaker highlights his innovative approach to art and culture. His vision is reflected in the diverse mediums and languages he works in, from poems to PTV dramas (Naya Qanoon, Toba Tek Singh), theatre plays (‘The Dark Room’), a documentary (‘Mughals of the Road’) and finally, his films and dramas (Fankar Gali, Jal Pari, and most recently Laa. His work constantly questions defined norms and now with Mah-e-Meer, even madness. We spoke to him via Skype about his upcoming film Mah-e-Meer, and ended up with notes on the Mughal Empire, a meeting with Omar Sharif, and a spirited discussion on the current state of Pakistani television and cinema. With the current cinema landscape of awaited films with patriotic agendas (Operation 21), mad-cap comedies (Namaloom Afraad), burning social issues (Dukhtar), and a possible remake of a gandasa wielding Maula Jutt, why would anyone be interested in a film on the eighteenth century poet? Even the producers played around with the more accessible title Poora Chand concerned that audiences were unfamiliar with Meer, but eventually they decided to tell them who Meer is and the symbolism of the moon lent itself to the title Mah-e-Meer. His fears though were unfounded as his cast and crew were mesmerized by the dialogues while shooting and the now famous line from the trailer, that small verbal artifice “hum yeh tou nahin kehey kay Ghalib kehta tha ya Meer kehta tha, hum kehtey hai Meer kehta hai” has captured the imagination of many. The strong visuals, colourful characters of the past contrasting sharply with the dusty reality of today have piqued a lot of curiosity, so much so that “people have developed a romance for Meer,” he recalls with surprise. He tamps down the hype surrounding the film claiming that it is not biographical but rather an interpretation of Meer’s experiences. It’s no surprise that Sehbai, an accomplished poet himself, sought Meer as inspiration. Flitting between the past and the present, the film fuses the story of a contemporary poet– an anarchist, who destroys traditions and experiences creative madness when he falls in love with a woman who appears to him though the full moon, mirroring Meer’s junoon. “So it’s that kind of vaishyat, that madness, that passion – the whole film is inspired by that experience” he explains. In exploring Meer’s past, was there ever a danger of romanticizing the exotica related to the grand old Islamic past? “The tawaif actually embodied the whole cultural metaphor of the fall of the Mughal Empire,” says Sehbai. There was a loss of beauty and pleasure embodied in courtesan culture along with a loss of power, he elaborates. Eventually what survives is art, not the Mughal Empire, as is true throughout world history. Power merely serves as the backdrop to how these stories unfold and this is alluded to in Mah-e-Meer as well. As with any independent film, co-directors Sehbai and Anjum Shehzad had their share of juggling budgetary constraints and shooting in the punishing summers of Lahore and Karachi. Sehbai fondly recalls working with the actors to create powerful visualizations of the characters through certain mannerisms, enriching them with the subtext and nuances. Sehbai whets our appetite further saying that most people are surprised at the performances he can elicit. “This is what is going to happen with Iman Ali, with Fahad (Mustafa), with Sanam (Saeed) and with Manzar Sehbai” he enthuses. His attempt is to unbind actors from the slavery to dialogue and text and allow for a more visual interpretation through their physical presence and movement, moving away from a very text oriented society to a more visual one. Expounding on this further, he talks of older actors and their statue-like stances projecting their voice, without moving their body. He maintains that we are still discovering the power of the visual and how to create the ambience on the screen and charge it with emotions and nuance. Some of this harks to how we perceive masculinity in our culture even though perceptions are changing. “Even India totally changed from Dilip Kumar to Shah Rukh Khan but in Pakistan it is the repression of the body. The body is not considered something sublime or something respectable in that sense. Even in Pakistani films I don’t think you will see the body being celebrated.” Sehbai says. Despite this, he says Pakistani film producers have fantasies of making a Yeh Jawani Hai Deewani. On watching the film Sehbai grilled the producer, “Do you have Ranbir Kapoor in Pakistan? Do you have 40 dancers, choreographers, huge set designing and all that? If you can provide all that I will make this film for you. Just get me Ranbir Kapoor,” he laughs. Though he wasn’t far from snagging a big Hollywood name himself. Sehbai recollects a delightful anecdote where he met and pitched a project to the legendary Omar Sharif. Despite being wined and dined by Egyptian Officers, his interpreter warned Sehbai that they would never let him meet the actor. Nevertheless, he managed to get her to find Omar Shariff’s number and arrange a meeting. He remembers him as a very open personality with whom he had a long conversation on world cinema, and his screenplay as well which ended with Omar Sharif asking Sehbai when he would like to shoot. With the fall of Benazir Bhutto’s government however, things took a different turn and if history was written differently, perhaps Pakistani Cinema would have had an earlier revival. So then, what are Sehbai’s views on the New wave of Pakistani Cinema? Wary of “pseudo, new wave, feel-good terms,” he cites the growth of an urban audience that seeks a different kind of film pointing to the emergence of the English theatre scene. He says multinationals helped build Pakistani English theatre for the middle classes who “in their upward mobility have forgotten about changing society or bringing in the revolution” he reflects. If, he says, you try to understand the emerging film landscape in sociological terms, why a Khuda ke Liye or a Bol was made, we need to refer back to the tiff between the civilian government, the army, democracy along with the old somewhat altered adage- follow the funding, which is mainly from the army or NGOs. He believes that a film can only transcend to art in the hands of the artist, who can invisibly subvert the funders agenda as Satyajit Ray’s classic film Pather Panchali did by subverting UNICEF’s agenda of making a film about poverty. As for his own works, Sehbai denies any interest in commercial filmmaking and like all sincere artists refuses to adopt airs either for himself or his project. Mah-e-Meer’s script was written quite a few years ago and his aim is to see his vision completed rather than pleasing the classes or masses. “I just enjoy multiplicity and different art forms and I have my pleasure.” he says. Was it this multiplicity that lead him to write the dramas Jal Pari and Laa? Sehbai chafes at the mention of his work in hands of directors with little vision. He wrote Jal Pari at the insistence of a friend and says that though they got the locations and actors right, the marketing demands left a bad taste in his mouth. Sehbai is less charitable with Laa currently telecast on Hum TV. Upset that they changed the screenplay with little regard for ethics or even an understanding of the content and lackluster performances, he scoffs, “The words are not lived, not organically experienced, they are thrown”. He complains that their speech is alienated from their body and from the whole sensuous experience of the performance. “Every Pakistani serial is structured on certain plots, but it’s the characterizations, the performance, the nuances, the layers you create where you forget, you transcend the structure,” he emphasizes. Disheartened at the interpretation of his vision, Sehbai avows this is the last time he writes for another director. As writer and co-director of Mah-e-Meer he exercises creative control on the film. As the film heads to post production, Sehbai leaves us with these final thoughts. He believes Pakistani Cinema is struggling to find its own authentic idiom. The audiences are looking for something that they can own and be proud of. “In this film, we have tried to discover that” he says. 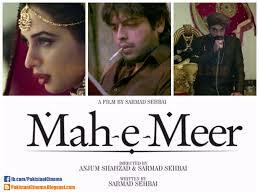 While on the surface, Mah-e-Meer presents a picture of love and madness, Sehbai’s true search lies in the rediscovery of heritage, poetry, literature, and music within our traditions. A whisper that echoes poetry, passion and madness, and one that we are eagerly awaiting. Cross posted here. Thanks to RB for his eagle eye and research knack on this one!